In a late thriller in Belgrade, Partizan’s guard Alex Renfroe made the lay-up and tied the game, forcing an overtime (85-85). The visitors remained competitive in the extra period (96-96) and tried to steal the road victory. But, Billy Baron took over and handed Zvezda the win. Baron scored nine of his 23 points in the final minute of the match and sealed the deal for his team. Partizan could not recover from a seven-point deficit (103-96) and, consequently, they were defeated. Apart from Baron, Dejan Davidovac had 18 points and six rebounds for the winners. Filip Covic contributed 16 points and nine assists. Vanja Marinkovic and Jock Landale posted 20 and 17 points, respectively, for the losing squad. Game 2 will take place in Partizan’s home-court. It is a must-win game for coach Andrea Trinchieri and his players. 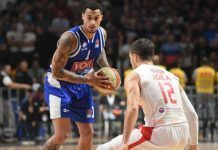 They will be eliminated from the ABA League Finals, if they lose again.